Front Page Public Relations has been helping startups, mid-sized companies and Fortune 500 corporations develop corporate communications programs for more than 25 years. Our fields of expertise include building websites, generating persuasive content, developing corporate message maps, and planning integrated marketing communications programs that include advertising, media relations, PR and social media management. Nothing is more important than the story you tell investors and your future customers. Gaining traction during startup mode is one of the toughest challenges bootstrapped entrepreneurs need to master. Front Page PR specializes in helping young startups develop interesting, polished and persuasive marketing communications messages that will convince new customers to buy your products and services and persuade angel investors to invest in your business. For most entrepreneurs, removing the fear, uncertainty and doubt from the sales equation is a critical 1st step in the business development process. Let us help you gain some marketplace momentum and start building a loyal customer base. Below are some very cost-effective ways to start generating some positive publicity for your business. A typical press release generates around 100 stories on leading blogs, magazines, TV stations and other types of media outlets, not just in the United States, but on a worldwide basis. Front Page PR will build a targeted list of media contacts in the United States that cover your product or service category. Front Page PR will spend up to 4 hours @ $150 per hour to build and clean a reporter/media contact list. Click here to purchase a Press List at the 50% discounted rate of $300. Front Page PR will spend up to 4 hours @ $150 per hour performing a competitive analysis of your top three competitors as well as research how leading publications are covering their stories. Based on this research we will write a 400-word, highly targeted and SEO’ed press release and issue it over Marketwired.com, the #1 news wire service in the United States. Each release comes with an analytics report that shows how many media outlets picked up the release, how many people read the release as well as the geographical click-through rate for people who visited the company’s website. This price does not include external wire service costs, which range around $250 for a 400-word release released in Texas that includes one logo. Extra photos and video attachments range from $75 to $125. Large city releases such LA and NY cost around $390. Click here to purchase a Press Release at the 50% discounted rate of $300. Front Page PR will spend up to 25 hours @ $200 per hour each month calling, emailing and texting tailored media pitches to a precise list of the top 50 reporters that cover your companies products. The goal of this program is build relationships between your executive management team and the media. It is a very labor-intensive process for your execs who will need to develop a message with our help and scheduling time to prepare for interviews and then spending time speaking with the press. It is a process that does not happen overnight and will grow slowly over a 12-month period and may involve press tours and travel. This option requires signing a 12-month contract. Click here to purchase a Media Relations PR Campaign at the 50% discounted rate of $2,500. Does Your Angel List, IndieGoGo, Kickstarter, WeFunder, StartEngine or NextSeed Crowdfunding Campaign Need a Major Advertising, Marketing, PR or Social Media Boost to Sell More Perks, Rewards or Equity Crowdfunding Shares? Austin, Texas – Crowdfunding PR announced a new Top 10 List of Marketing Strategies to Boost Crowdfunding Campaigns on AngelList.com, IndieGoGo.com, Kickstarter.com, WeFunder.com, StartEngine.com, NextSeed.com or any other top crowdfunding sites in the United States. These time-tested, proven marketing strategies will help crowdfunders generate a significant amount of marketplace awareness, which in turn will provide a higher number of click-through visits and better conversion rates when pre-selling popular perks, attractive rewards or selling equity crowdfunding shares. Also Read: What are the Top 20 Title III Equity Crowdfunding Sites Ranked by the Most Amount of Money Raised in the U.S. Using this Top 1o List of Crowdfunding Marketing Strategies, Front Page PR shares valuable marketing methodologies with crowdfunding campaign managers to give them a sense of direction on how to research, plan and launch very cost-effective marketing campaigns with little or no budget for a small consulting fee. This allows bootstrapped crowdfunders to receive professional consulting services at an affordable price so that they can learn how to generate a significant boost for their crowdfunding profiles traffic before and during their fundraising campaigns. For serious crowdfunding campaigns that have larger, well-thought out budgets and a real business plan, Front Page PR can maximize their crowdfunding marketing programs to achieve maximum reach and frequency by harnessing a combination of advertising, email marketing, event marketing, media relations, public relations, and social media to gain widespread publicity, earn organic search engine traction and accelerate that growth with paid advertising and sponsored content marketing. Crowdfunding PR has a 28-year track record of using successful marketing, PR and social media campaigns to launch products and services, grow businesses, build sales/distribution channels and locate customers with the highest propensity to buy a company’s products and services. For the past 5 years, Front Page PR has been employing these same time proven marketing skills to help clients produce successful crowdfunding campaigns. Need Help Planning an Equity Crowdfunding Campaign? If you would like to learn the best strategies for marketing your crowdfunding campaign and doing the proper amount of prep work before the crowdfunding campaign begins, please contact Robert Hoskins, Crowdfunding PR at (512) 627-6622 for a free 30-minute consultation. Front Page PR offers the following marketing programs for crowdfunding portals as well as their crowdfunding campaign managers. And while crowdfunding is the buzzword for 2015, these marketing strategies will serve any entrepreneur, startup or business that wants to launch a product or service in any B2B or B2C vertical business segment. If need some help figuring out your marketing and/or crowdfunding strategies, please fill the business lead form at the bottom of this page. 1. Press Releases – A professionally written press release issued on one of the top 3 news wire services is probably one of the most cost-effective marketing strategies on the planet. Depending on the press release’s subject matter and SEO keywords, press releases will be picked up by hundreds of electronic media news outlets in the United States and around the world. A typical press release generates around 50,000,000 gross impressions and hundreds of click-throughs to a website or crowdfunding campaign. If you email well-written crowdfunding press releases to bloggers like me (rhoskins [at] frontpagepr.com), we may take your press release, turn it into a story and then publish it on our blog that is followed by a global network of media outlets and crowdfunding readers. All stories require a picture, graphic or logo to be accepted. 2. Writing Effective Press Releases – One of the hardest things to do in the marketing world is find a great copy writer to generate quality and relevant content. There are a number of companies that troll new Kickstarter and IndieGoGo crowdfunding campaigns offering to write press releases and put them on a wire service for a very cheap price. Front Page PR receives lots of phone calls that lost several hundred dollars and didn’t even get a press release written. The main problem with cheap PR companies is that they do not have the English language mastered. All of Front Page PR writers were born and raised in the United States, speak English as their native language and write content in Associated Press (AP) style, which is what all media outlets require. The other consideration is how much time and effort a PR firm invests in the researching and writing of a press release. This means doing a competitive analysis of similar products and services on crowdfunding sites as well as researching top competitors via Google searches. This process is important to be able to effectively position your company successfully against the competition. In addition, a PR firm should spend many hours researching the editorial environments and only target media outlets that contain the highest composition of client’s correct target audience, which will need to have a high propensity to buy the products and services being offered as perks/rewards during the crowdfunding campaign. Excellent writing requires time, effort and cannot been done effectively for less than $800 to a $1,000 per release depending on the complexity of the subject matter. More importantly, the same prep work that is done to write the press release is also critical when writing highly tailored media pitches that are sent via email and social media to entice reporters to cover a story. For example, if you are trying to sell triangles, the PR account executive will need to research and find triangle magazines to see what type of stories are being written for their readers. The problem is that most low-priced firms do not put in the time to understand what types of stories will be accepted and which ones will be rejected. Sending a triangle story to a circle or a square magazine will never work. And, even if by pure luck you convinced a circle reporter to write a triangle story, it would be pointless because circle readers only read circle magazines to learn about circle related products and services. They have zero interest in buying anything but circle products and services. This sounds like a simple concept, but ask any reporter how many pitches that they receive on a daily basis that do not fit their editorial environment and they will tell you they hit the delete button in less than two seconds. Thus, hiring a PR firm that can build a precise database of only triangle media outlets and sending only carefully crafted triangle media pitches is essential to generating positive news coverage and feature articles. 3. Social Media Networks – The second most important thing after using PR to generate positive publicity is to build a large social media network so that you’ll have a massive group of people with which to share your news and marketing materials. If you have network of 5,000 contacts that each have following of 5,000 contacts, you can use social media networks to reach a potential audience of 25 million people for free. It is very important to build social media profiles on Facebook, Google+, Instagram, LinkedIn, Pinterest, StumbleUpon, Tumblr, Twitter, WordPress and YouTube. Have social media accounts? Please follow us and we’ll return the favor. Don’t have any social media accounts setup? Need help getting started? No problem, Front Page PR can get 10 or more social media accounts setup for you is less than a week. It would be wise to shoot for a goal of 2,500 Friends/Likes on Facebook, 2,500 connections on LinkedIn and at least 5,000 to 10,000 real followers on Twitter. This may take several months, but needs to be done before trying to launch a successful crowdfunding campaign. 4. Sponsored Social Media Posts – If you are new to social media, it won’t take you very long to realize that building a solid base of qualified social media contacts takes a lot of time and effort. It can sometimes be disheartening to follow several hundred people in a day only to receive a 25% response rate from people that return the favor. The good news is that Facebook, LinkedIn and Twitter all have a wide variety of digital advertising, sponsored posts and content marketing options that can significantly speed up the process of gaining likes, followers, shares and retweets. There are so many different advertising options that it can be very confusing to know what to try first, what options work best and what kind of budget will be needed to achieve the desired response rates. Hiring an experienced social media team like Front Page PR is the best way to achieve short-term success. 5. Content Marketing – One of the best ways to build awareness for your products and services is to utilize a content marketing strategy to distribute your company’s press releases, blog posts, photos and videos. A very cost-effective way to start this process is to setup a free WordPress website. A WordPress site is great for generating content and then sharing it with all of your social media accounts via its Real Simple Syndication (RSS) feed. Every time you post a new blog, a news story, photos, videos and/or URLs links, the WordPress site will automatically push the new content to all of your social media profiles at the same time with the push of one button. 6. Media Databases – The foundation for every good PR campaign is a highly targeted media database. Front Page PR uses very expensive PR database tools such as Cision, Meltwater and Vocus to do sorts on every media outlet in the United States to find reporters based on keywords in their news coverage bios and the last several articles they have written. These services cost $3,000 to $5,000 per year, but are a critical tool is creating targeted PR campaigns. These tools make it very easy to do a sort and generate a list of several hundred reporters that cover a subject matter, but it is a very time consuming process to clean the list and purge reporters that do not fit the right profile. This is why high-end PR firms charge more money for our services. It is also why our success rate is significantly higher than cheaper PR firms that want to sell you their services online with a credit card without ever having the chance to talk to a live person. If you would like save some and do the hard work yourself, Front Page PR will build PR databases for clients at $1 per contact. This will be the initial sort that contains 300 to 500 reporters based on the keywords in their writer bios. The problem is that these databases still need to be cleaned to weed out reporters that may have the right keywords in their bio, but haven’t written about the subject matter in many months or perhaps they have a negative tendency. You’ll have to Google search every single reporter on the list to find out who the best reporters are to contact. 7. Media Pitches – Conducting good research on a reporter’s beat, their last three stories and the media outlet’s editorial environment is the key to writing a persuasive media pitch. Media pitches can be sent via email and/or through social media networks based on the reporter’s preferences. The best strategy is to send each reporter their own personalized pitch based on what they have written over the past six weeks. Imagine how much time it takes to read the last three stories that a reporter has written and then sending each reporter a personalized media pitch for a list of 300 reporters. It requires a lot of time and effort, but the payoff is well worth the effort. 8. Media Relations – Once a PR database has been built, good PR firms like Front Page PR have very experienced media relations experts that work with the press to build relationships between their client’s executives and reporters. These relationships require a lot of time and effort to build, but will lead to many successful media interviews. This process also involves media training executives and teaching them how to share the right kind of information with reporters. Providing reporters with news they can use is the best way to generate interviews that lead to feature articles and a long lasting relationship with each reporter. Reporters will return to their reliable sources over and over to write numerous stories once a relationship has been built. A good media relations pro will spend anywhere from 20 to 40 hours a week pitching reporters via email and twitter. Most junior PR people make at least $25 to $50 an hour. This is another good example of why anyone that offers to do a press release for $300 simply cannot afford to do a good job. Working a list of 300 reporters takes many, many hours of work. Sometimes it takes several hours of emailing, checking schedules and making phone calls just to get one interview setup. 9. Event Marketing – Event marketing is a great tool to use during the bottom of the “U” also know as the “Lull” during the middle of a campaign. When planning a crowdfunding campaign’s launch date, scheduling the crowdfunding campaign so that a major trade show like CES, Cebit or Interop falls right in the middle of the campaign is an excellent strategy. This allows a client to generate lots of publicity for the campaign’s launch, more news at the major trade show event (where all industry reporters and industry analysts congregate), and then even more news as the campaign exceeds its fundraising goal and/or stretch goals toward the end of the campaign. 10. Email Marketing – Email marketing isn’t used as much during crowdfunding campaigns as PR and social media, but it is the most successful type of marketing that can be used to deliver paying customers to successful crowdfunding campaigns. Most startups have a new website, but most haven’t had time to build up a good database of customers. Front Page PR can help clients build double opt-in email databases of interested customers by offering them an opportunity to learn more about a product/service, downloading a free white paper, requesting early bird discounts/coupons, subscribing to newsletters, etc. A database of qualified customer emails is very useful for pre-selling perks and rewards and building a customer loyalty network. A large database of prospects is also an extremely useful tool when trying to build large social media networks. Want to talk a crowdfunding PR professional about consulting services or hiring a PR firm? Please give me a call with all of your curious crowdfunding questions! Last year crowdfunding platforms raised $2.7 billion and successfully funded more than 1 million campaigns, according to California-based research company Massolution. 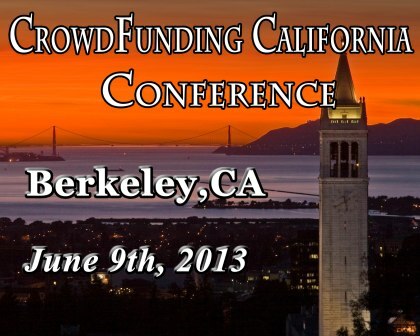 Business executives that want to learn about this crowdfunding phenomenon and to meet leading industry insiders should register to attend the CrowdFunding California Conference which will be held in Berkeley on June 9th. The Crowdfunding West Conference is presenting an unprecedented lineup of experts from crowdfunding platforms, legal firms, investment community and entrepreneurs who have risen (combined) almost $2,000,000 for their projects through crowdfunding. The morning session will consist of discussions about rewards-based crowdfunding. Special panel is devoted to community programs. The afternoon session will help the entrepreneurs better understand their fundraising options, including equity crowdfunding, peer-2-peer lending, angel investments and rewards based crowdfunding. Opponents of crowdfunding movement will have a chance to present their position at the debate moderated by David Drake, well known New York investment expert and speaker. Among the speakers are the representatives of the global leader in microcredits, Kiva, crowdfunding platforms WhenYouWish and Realty Mogul from Los Angeles, Upstart from Palo Alto, “Investment bank for startups” MicroVentures, Colorado-based portal Community Funded and CrowdIt from Missouri, world’s largest network for entrepreneurs EFactor, fundraising platform for kids PiggyBackr, investment consulting companies North Capital, Inc. and Cutting Edge Capital, payment services platform BancBox, SaaS portal VentureDocs, well known lawyer and blogger Antone Johnson, CEO of uBiome, Jessica Richman, the creator of the fifth most successful campaign on Indiegogo Sonny Vu and the founders of Mothership HackerMoms community from Oakland. Crowdfunding California Conference is created by Crowdfund Productions, the organizer of investment and crowdfunding events in the USA. Other 2013 conferences will be held in Boston, MA, Charlotte, NC, Seattle, WA and Chicago, IL. On January 6th – 7th, 2014 Crowdfund Productions will be hosting Global Aspen Investment Forum in Aspen, CO.
Last June, BancBox, a payment services platform similar to Stripe, debuted its platform allowing developers to build a lot of different payment services. As cofounder Sanj Goyle claimed at the time, “PayPal could be built on top of our platform.” Now it has launched BancBox Crowd, what is — as far as we can tell — the first independent escrow service aimed at crowdfunding portals that operate on equity, debt or revenue share models. The company is also announcing partnerships with crowd investing services 99Funding, SoMoLend and Localstake. BancBox Crowd claims to be the only solution on the market that provides online investment portals with an automated escrow solution that can replace the manual paper escrow process. They also say it is compliant with FINCEN, FINRA and SEC requirements. In essence it means being able to create independent escrow accounts for each crowd-backed project, collect funds from those many investors, and either safely return funds if the project doesn’t work out, or disburse those funds when the project, whatever it is, reaches its funding goal. Goyle says, “We want to have the payment part of the experience of an investor to be a sticky experience so we make it as easy as possible to pay and go through the process.” He says the business model is based on a set transaction fee to the platform partner. You could say they know about payments. BancBox manages $100 million in consumer deposits daily in nearly 200,000 individual accounts. Its transaction volume has increased 100 percent to nearly $2 billion annually. What Is Escrow And How Does It Work?